Excerpt: President Bush formally launched a sweeping internal review of Iraq policy yesterday, pulling together studies underway by various government agencies, according to U.S. officials. The initiativeâ€¦ parallels the effort by the bipartisan Iraq Study Group to salvage U.S. policy in Iraq, develop an exit strategy and protect long-term U.S. interests in the regionâ€¦The White House's decision changes the dynamics of what happens next to U.S. policy deliberations. The administration will have its own working document as well as recommendations from an independent bipartisan commission to consider as it struggles to prevent further deterioration in Iraq. When I saw the Newsweek cover featuring Big Daddy Bush muscling toward the front with a diminished little Dubya skulking in the background, my first thought was: How is Junior going to react to this? Bush II's resentment toward his father is well-known -- a resentment no doubt compounded by his lifelong, abject dependence on Daddy's financial and political pull -- and I knew that Little Bush would not simply accept this media humiliation and move on. Bush has also taken every opportunity during his tenure to diminish, downplay or even belittle his father's personal influence and political record. He evinces far more personal animosity toward his father than, say, Bill Clinton, his supposed political bÃªte noire. 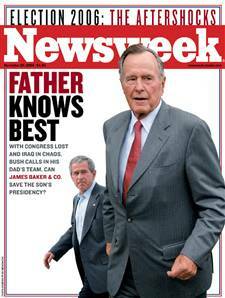 Thus the Newsweek cover was probably a greater humiliation for Bush than the election results themselves. Indeed, the latter only confirmed his contempt for the American people, as he made clear in his post-election press conference with his casual put-down of voters: "I thought when it was all said and done, the American people would understand the importance of taxes and the importance of security." The not-so-subtle implication here is that the American people were too stupid to understand how good they've got it under his glorious reign. Bush's reaction to the Newsweek cover â€“and the whole gamut of high-profile media stories pushing the line that Daddy's men are moving in to take over the government and rescue Junior from the mess he's made â€“ was not long in coming: just a week after the election. The Washington Post nailed it â€“ then very curiously buried it on page 16, perhaps because it contradicts the new conventional wisdom about the return of Bush I (the ditheringly incompetent, deeply corrupt, sinister covert operator suddenly transformed into a wise, moderate, accomplished elder statesman) and the Baker-Gates salvage operation. His new book, State of Denial, is a stinging attack on the Bush-Cheney Factionâ€¦ and the presence of "Bandar Bush," the Saudi royal, and Scowcroft, the Bush Senior courtier, among Woodward's main sources tells us that Daddy Bush has reverted back to the old-line, white-bread, "Eastern Establishment" in a move against the Sunbelt oil men, crank pseudo-Christians and Nixonian diehards like Cheney and Rumsfeld that Junior Bush has thrown in withâ€¦. Bush Junior â€¦is a true scion of the predatory elite that has served as America's aristocracy for generations...And that's why it will never come to impeachment or resignation [as it did with the lowborn bagman, Richard Nixon]; such things would reflect too badly on the elite itself, not least on Daddy Bush, one of its leading lights. But some strong shots across the bow, some public humiliation, something to get Bush and Cheney to alter the disastrous course in Iraq â€“ that's fair game, and that's what we're seeing today from some of the old-line Establishment factions. â€¦For make no mistake: what we are seeing is a "war in heaven," an intramural struggle between elites, a falling out among thieves, and, literally, a family quarrel in the imperial house. It has nothing to do with the welfare of the American people, or the restoration of democracy. The "consent of the governed" will play no part in how the affairs of the state are finally ordered by the exalted ones. Little Bush's suddenly conceived internal Iraq policy review is just another salvo in this ongoing struggle. The Cheney militarists will certainly not give up without a fight, even after the "Gray Hawk Down" disaster of Rumsfeld's resignation. Bush Junior will certainly not keep swallowing Daddy's cod liver oil without throwing a fit now and then. American policy will continue to drift back and forth between Junior's hyper-aggressive corporatist militarism and Daddy's slightly less aggressive corporatist militarism (which is pretty much the default "bipartisan" foreign policy of the past 60 years). The comforting storyline that the "grownups" are stepping in to set things to right is the usual dangerous, reductive nonsense of the corporate media worldview. Daddy's men and Junior's men are all part of the same political network (or crime family, if you prefer). There may be power struggles between them over certain issues, personality conflicts, policy disagreements, but they are all ultimately working for the same mutual interest: their own aggrandizement (in various forms â€“ power, honors, riches, ideological triumph, etc.). The "war in heaven" is real, but there will be no actual losers amongst the combatants. Loss of face is the worst punishment the vanquished will endure; even if they're booted from public office, like Donald Rumsfeld, they simply return to their private world of vast personal fortunes, corporate directorships, and backroom sway. Until the political winds shift again, and they're back in the saddle once more â€“ like Robert Gates, returning to office 14 years after his shadowy service for Reagan and Bush; or indeed, like Rumsfeld himself, who went a quarter of a century without official title between his Nixon-Ford tenure and his restoration by Junior Bush. The profitable, bloodsoaked game goes on, regardless of elections and internal squabbles.